A text-centric medium no longer. Beautiful and so clever, no airplane in this ad. Whether online video has asset value (premium, high production value, offline content) or not (UGC, viral etc. ), advertisers/brands are still feeling their way through this emerging medium and marketplace. Advertisers want to be wherever the views are, but do so with some perceived risk and trepidation. At the end of the day, if the video is getting views, it has value. I must admit to somewhat loathing the barrage of Top 10 lists that populate the interwebs this time of year. But the end of the year does undeniably provide a good canvas for reflection and perspective on what worked on the web, what didn’t and what may be on the cusp of having a big impact in the coming new year. To say that social advertising or ‘social ads’ were a big deal in 2010 is an understatement to the point where it is almost becoming redundant to give it a special ad label. The goal of almost all advertising today is to get people to interact, engage and share your brand messaging. But just how big is social advertising? Like most things, it all depends on context. Without thinking I bet most folks who read this blog could probably guess which social ad campaign was the biggest in 2010. I don’t smell like him, I don’t look like him and I’ve never bought the product, but I certainly saw plenty of Old Spice guy Isaiah Mustafa this year. To the tune of 68 million+ viral video views, Old Spice was the social advertising king of 2010. As consumers continue to gain more power and control over what messages they are exposed to, it is increasingly paramount for marketers to challenge the very definitions of what is considered advertising. Ultimately this means marketing must continue to bleed further into the realm of entertainment because if consumers don’t find your marketing engaging and compelling, if they don’t *want* to watch, they will tune your messaging out. The Old Spice campaign was brilliant because it was a great mix of cultural, economic and creative energy that resulted in a unique and entertaining concept that challenged our assumptions of what an advertising campaign was. As we embark on a new year, it will be interesting to see which social advertising campaigns in 2011 are most able to transcend the traditional walls of advertising, and entertain us. Social media is growing up. No longer just viewed as an augment or value-add initiative, more and more brands are starting to lead with their social strategy. The new Ford Fiesta 2011 campaign is the latest example of a big brand seeding and engaging online through social media prior to unleashing a follow-on traditional media campaign. The campaign is a “paradigm shift” for Ford, since it’s the first time the automaker has marketed a new car using social media, and then followed up with traditional media, said VanDyke. The strategy was to establish brand awareness prior to entering the U.S. small car market. In the first 18 months, Ford sold 750,000 Fiesta 2011 units in Europe and Asia. In the U.S., however, Ford doesn’t have a small car presence. Hence, a social media campaign, dubbed “Fiesta Movement,” which kicked off last year to fuel the necessary hype, VanDyke said. Not only is the digital/social-first mantra becoming more prevalent, but it is also bringing more focus and greater emphasis on gaining earned-media traction from traditional campaign efforts. An idea that doesn’t generate more content isn’t a very good idea. Is T-Mobile’s viral campaign a shining example of social media? Or is it a rip-off? Or both? Is T-Mobile’s viral campaign a shining example of social media? Or is it a rip-off? Or both? I think these are fair questions in the wake of T-Mobile’s recently released commercial which features a crowd of 13,500 people singing the Beatles ‘Hey Jude’ in unison with celebrity vocalist Pink leading the way. On the one hand, it really is an impressive commercial spot in terms of scale. They used over 2000 microphones and 40+ cameras to capture the event in a public venue. T-Mobile successfully used social media tools like YouTube, Twitter and Facebook to bring awareness to the event, which is a genuine social media victory given the large turnout. The end result is a polished commercial concept that is successfully going viral on the internet and getting much attention from the frontlines of the social media crowd. But is this really what social media is all about? Is this what we should be pointing to when companies want examples of social media / viral marketing done right? I’m not so sure. If there is any social media brilliance in the T-Mobile ‘Hey Jude’ campaign it is in their use of social media to organize the large public gathering. But that is pretty much where the ‘social media’ aspect of this ends, and where the rip-off begins. This ‘sing-along’ concept was pioneered 30+ years ago by Coca-Cola. Do you remember that 1971 commercial? If you are 30+ years of age, I bet you do. That’s 10,000 people at an American Idol audition in Atlanta (2007) singing Coca-Cola’s song over 35 years after the commercial aired for the first time, and even more impressive is that the primary demographic attending that event were likely not even born when the original commercial was made. How much is that worth to Coca-Cola? Priceless. In my view, the best examples of any form of marketing, especially social media marketing, needs to have an element of originality to it. If you simply copy, borrow or outright steal concepts, you will never hit the same mark as the original, and more importantly, you will potentially lose the biggest benefit of social media marketing – timelessness. Due to the saturation of brand messages in the marketplace, advertisers today should be trying to push the boundaries of aesthetics and originality more than they ever have. That is precisely what made something like the Eepy Bird – Diet Coke + Mentos viral videos such an incredible albeit accidental boon for Diet Coke and Mentos, or the Subservient Chicken campaign for Burger King. They were completely original concepts that will endure for decades. I’m quite certain if and when a large public gathering in the future spontaneously starts singing ‘Hey Jude’, it will have little to do with T-Mobile, and everything to do with a band called The Beatles. Just stumbled across some of the new online display ads for the Mac vs. PC Guy campaign on CNN.com. They talk to each other from different ad placements on the same page. Very well done. I wonder what Seinfeld has up his sleeve for the folks in Redmond?I was talking to an ad exec recently who mentioned that the agency behind the upcoming Microsoft/Seinfeld campaign Crispin Porter + Bogusky almost exclusively use Macs in their office. When an agency lands a big client they usually begin using their products religiously, but apparently the folks at Crispin Porter + Bogusky have no intention of switching to PCs until they can convince themselves through their own marketing efforts that they should. Think they’ll switch to PC? Me neither. McDonald’s is really going for the gusto in an effort to shift their brand image. 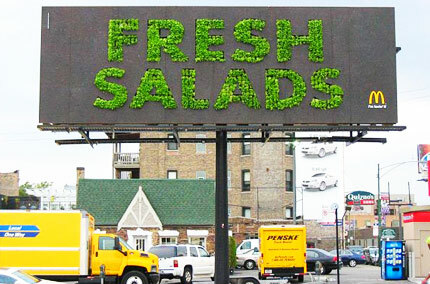 This billboard which ran near Chicago is an interesting concept. It literally grew into an ad. Check out the time-lapse ‘making of’ video. In the United Kingdom, McDonald’s has just launched a $10M campaign to project an image of freshness, family and local food sourcing. Here’s the UK 60-second spot done by Leo Burnett called ‘Planting’ as part of this new campaign. In association with the campaign they also flexed some social media marketing muscles. An example of this would be their hiring of Vox Pops to hit the streets and get some reaction to their new campaign spot from the public. Apple’s nifty, tongue-in-cheek ads and Microsoft Vista’s inability to resonate with consumers is proving to be a potent combination that is successfully converting Windows consumers to the Mac platform. While Vista has been a big albatross around Microsoft’s neck, according to Advertising Age, the effectiveness of Apple’s marketing should not be underestimated. But then last year his friends started buying iPhones and making the switch — “guys like me, who didn’t really care for Macs.” And when the latest Windows operating system, Vista, came out, “It didn’t do anything for me,” Mr. Alison said. “The very initial version was really a mess.” So he went to an Apple store. The clean, simple and friendly experience convinced him it was time to consider a Mac, and now, six months after his first MacBook purchase, he has added a desktop Mac Pro and another MacBook Pro. (You can read more about his experience on his blog, www.davidalison.com.) Mr. Alison’s experience is not unusual. Blog after blog chronicles the move from Windows to Mac operating systems — and more than a few were precipitated by Microsoft’s now one-and-a-half-year-old Vista. And with the final door having closed on XP on June 30 — Microsoft is no longer allowing manufacturers to sell new computers pre-loaded with XP — it’s possible user frustration could translate to even more sales for Mac. “Apple has told a good story, created good products and created a good [retail] experience for people to buy Macs,” said Jupiter Research analyst Michael Gartenberg. However, he added, “The whole Vista launch was such a debacle, and that has helped Apple.” The launch “debacle” he’s referring to is the January 2007 debut of Vista, which was not only delayed by more than six months, but also was “buggy,” with compatibility problems and uneven quality noted in many early reviewers’ and users’ opinions. And the estimated $500 million spent on the launch seemed only to draw a bull’s-eye around the operating system. Indeed, half of the eight “Get a Mac” ads Apple and its agency TBWA created so far this year mention Vista. And the latest, “Sad Song,” has the PC guy singing “The Vista Blues” about how Vista is causing people to leave him for Mac. Read full article: AdAge: More Consumers Make the Switch to Macs On a totally separate note, but still Apple-related, check out this interesting music video that was done completely and literally, on a Mac.